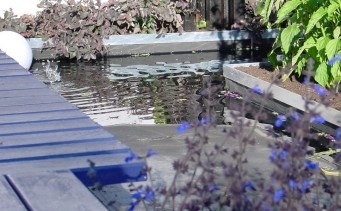 There are almost as many ways to finish your pond edge as there are ways to build your pond. Here we detail some of the most common methods. In formal installations where the sides are vertical and the shape is regular, the Beutyliner can be made as a flat sheet or as a box section with vertical sides. The top edge gets folded onto the top of the wall blocks and a capping block is installed to hold the liner in position. Rocks, grass, plants, etc can be used to soften or highlight a pond. By covering the exposed area with any or all of these items, the liner can be hidden and a natural finish achieved. When installing into a structure where one or more of the sides are walls, a neat finish can be achieved by cutting a 15mm deep chase into the brick line. Once this chase is cut, trim the Beutyliner 15mm past the cut, then force the liner into the chase with a putty knofe. A final seal is achieved with a black polyurethane sealant. NOTE: Silicone will not work with Beutyliner. Beutyliner can be left exposed or covered with a variety of protection systems. In most applications it is left exposed or covered at the edge only. Protection systems can include pebbles, sand, concrete or other solid building materials. In all of these applications Beutyliner forms the waterproofing element and the cover forms the protection. A geomat reinforcing/protection should be used between the Beutyliner and the protection system.